How many times have you told someone your story? Sharing mine is a relatively new thing for me to do, considering I was 20 years old before I discovered the freedom and the joy it brings. When I left for Haiti last week with the Long Hollow Women’s team, I wondered what I might give and what I might take from the experience. As it turned out, my story was an integral piece of it all – of what I gave and what I got. From the very first night of the trip, God set up unique opportunities, one after the other, of telling my story to members of our team. I’ve noticed that each time I honor God by sharing how He has steadily been my protector and provider through a childhood (and several years of adulthood) of physical and verbal abuse at the hand of a single parent, He blesses me by revealing even more of His character; His kind, good, steadfast character. By Wednesday of last week, the middle of our trip, I’d had the joy of telling my story every day to a new person. Each time I did it, I learned something new about my own experience, as it spoke to those I was telling. Different parts of our own stories resonate with people in different ways. It’s a beautiful thing to hear how your experience relates to others. 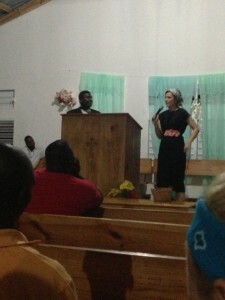 By that night, I had agreed to share my story with the Community Church in a service we would attend after dinner. It was clear to me then that God had been preparing me the entire time, giving me guidance and a peace about sharing my story in a live setting, out loud, in a group larger than 3 or 4 people (which was a first for me)…not to mention with the assistance of a translator! I’d be lying if I said I had no reservations or anxiety about going through with the commitment, but this turned out to be one of those experiences and steps of faith I know I will treasure for this lifetime. As I told my story, there were moments I had no idea what I’d say next as I paused and the translator spoke, but the Spirit was faithful each time to give me peace and the words to speak. Several times, I mentioned details I typically would have left out of my story if I were just telling a friend, but through what I believe to be the Spirit’s intercession, those details connected with our Haitian brothers and sisters in significant ways that elicited great response and, I was told, cultural relevance and encouragement. We all know Philippians 4:13, right? “I can do everything through Him who gives me strength.” It’s easy to remember, it’s encouraging, etc. But what about the context? If you back up a few verses, I get a sense that Paul gives us a reason to trust him in saying so. He says, “I am not saying this because I am in need, for I have learned to be content whatever the circumstances. I know what it is to be in need, and I know what it is to have plenty. I have learned the secret of being content in any and every situation, whether well fed or hungry, whether living in plenty or in want.” and then he says, “I can do everything through Him who gives me strength.” Because he has lived through so much, because of his experiences, because of his story, he can say with confidence that he can do all things through Christ. 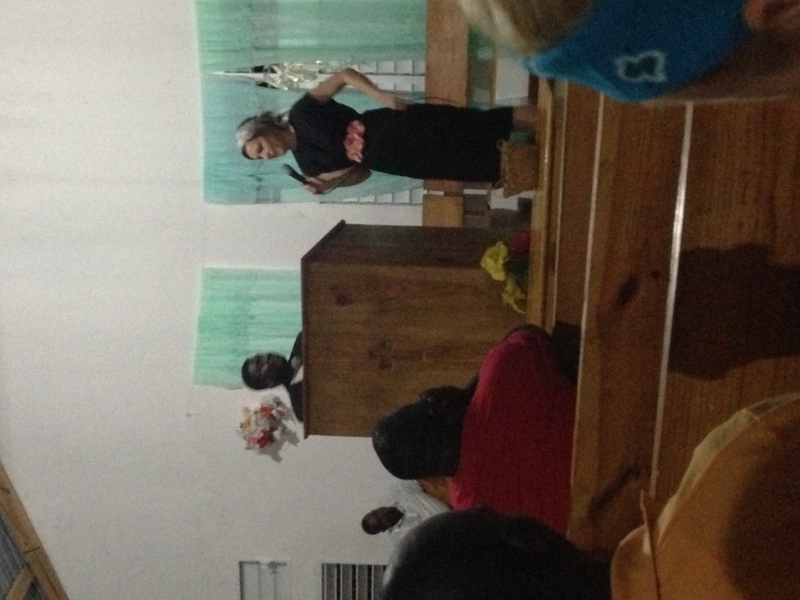 I explained to the congregation in Haiti that because I knew what it was to live in plenty and in want, to be hated and to be loved, to have lived in danger and in safety, to have been abandoned and to have been rescued … because of my story, they had reason to trust me when I proclaimed that our God is a God of protection, provision, love, and redemption. And now, I’m telling you: because I have known what it is to disobey God out of fear and discomfort and I now know what it is to obey him in spite of fear and discomfort, you can believe me when I say He is faithful to use it for good. He is faithful to free you from that fear. He is faithful to teach you even more about Himself, to change you, and to change others from the power of the story He’s written for you. I cannot explain the blessing it was to testify God’s love and truth and power to that church, no matter how frightened I might have been initially. Trust me. When given the opportunity to honor God with your story, whether one-on-one or in a crowded room, don’t say no! We really had an incredible time in Haiti last week. To get more of an overview of what we all experienced and to enjoy wonderful photos from the week, check out Tami Heim’s post over at the Love A LOT blog. God’s steadfast love indeed never ceases, His compassion never fails…I can see that so beautifully in your story. Just finished preparing my last session of Daniel (part 1) for fall semester, Daniel 6. One thing that strikes me concerning your story & his is the persevering faith it takes to witness first hand the saving grace of God. The faith is a gift…the courage too. Our stories certainly resonate with each other sweet Cara…we will have to sit for coffee one day soon. Love you to pieces in Christ. Thank you for obeying Him…enjoy the blessing of it!! I love this post & you. What an inspiration and blessing you are to everyone you meet.